It doesn’t sound like a “salad” at all. Greens, fried potatoes, and fried eggs. Most people I talk to tell me that it completely defeats the purpose of eating a salad. No, not at all. A deftige Bauernsalat – farmer salad – is one of the Rhein region’s true culinary delights. It starts with some field greens, placed on one half of a plate. Dress them, then add vegetables of your choosing. Top with cubes of fresh cheese, a wonderful feta-like preparation. On the other side, bring on the Bratkartoffeln, those strange yellow potatoes that have been boiled and fried with plenty of salt and spices. Top those off with two Spiegeleier – sunny-side up eggs. It goes from just salad to meal in no time at all. And it’s yummy. It does not defeat the purpose of salad at all. It makes just a salad into a real dinner. “STOOOOOOPPPPPPPPPPPP!!! !” I yelled. We were in our temporary apartment in Germany, I was in the shower, and someone had decided to wash dishes. Oh. My. God. My skin was suddenly peeling off thanks to alternate bursts of freezing cold and boiling hot water. The German conciousness includes the perjorative term “Warmduscher” – literally a person who likes hot showers, or moreso, a person who eschews cold ones. Basically, a person who likes comfort. After all, who could possibly want to be comfortable? That would be inefficient and self-centered, right? I don’t mind being uncomfortable, sleeping outdoors is fun, and come on, I ride motorcycles until the roads ice up. The elements are not foreign to me. But that abrupt switch from nicely hot water to cold (or worse, even hotter) in the shower? How about NO. The demand for energy efficiency, combined with a lack of caring about whether a shower is a nice place to be or not led to the demise of the (apparently) horribly inefficient hot water tank in Germany. 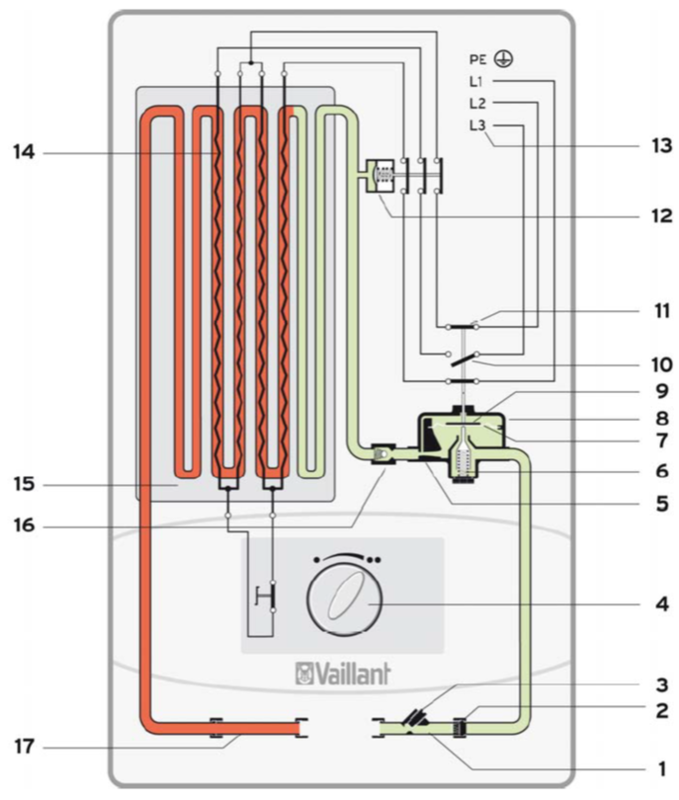 Enter the Durchlauferhitzer – an extremely efficient version of the basic in-line on-demand water heater. It is a horrible little 5 to 20l electronic confection that claims to deliver hot water exactly where and when you need it. It does, with one caveat – it’s pressure drop actuated – so FSM help you if there is more than one fixture connected to it. Unlike on-demand units in the US that regulate the outlet water temperature and pressure to maintain some semblance of control at the faucet, the German variety of the unit is either on, or, off. And because it’s pressure drop actuated, getting any control at the mixing valve is a delicate ballet of pressure balancing. Wait. They don’t have pressure balancing mixer valves over here, either. We moved into the house eventually, and my hopes for Fernwärme (city steam) were dashed. Three of the miserable little devices were installed instead of a single hot water tank or simple valve in the basement. The device in the kitchen was the most damned of all of them – a 5l unit that delivered what amounted to either cold water or steam. 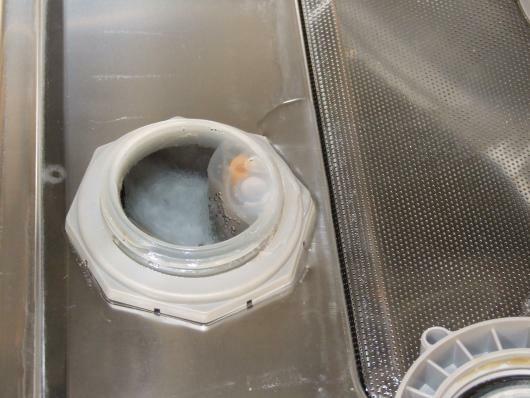 In steam mode, one had about five minutes of dish washing and rinsing time before the it was back to cold water. Fifteen minutes later, the steam was back on. No amount of twiddling with the dial produced any temperature other than scalding or cold. So much for adjustability. It looked adjustable. I guess that was good enough. The unit on the upper floor was equally useless. It had two settings, both of which were at the mercy of the incoming water temperature. Eventually, we gave up on it and allowed the boys to shower on the first floor, where the installed 20l unit had not only a temperature dial to set, but a selector to choose how many of the three heating elements one wished to use! We monitored the seasons and the weather in the nearby mountains in an attempt to predict how to adjust the dials to achieve that elusive hot-but-not-scalding water. This unit was so sensitive to pressure drop changes that we did not do anything with household water when a shower was underway. Eventually, we found it best to use it as the thermal control for the shower and just run the shower valve straight hot, avoiding most pressure drop issues. One thing we found with each of the horrible little misery machines was that they leak water out of the outlet side when heating. Not a problem when you are running water, but when not, there is a constant drip. Because the water is hard as a rock, you get constant calcium buildup. I’d post a picture, but honestly, who wants to see that? The time spent soaking various parts of faucets and other water-use devices in vinegar and other forms of chemistry became measurable as time in the house dragged on. The chiseling of hard water deposits out of the toilets was a special task reserved for the boys. The one place that we did not have to worry about calcium buildup was the dishwasher. German dishwashers include a built-in water softener. You pull out the racks and add salt to a container in the base of the tub. I was shocked by this. I refused to believe it was required. Then, I had to clean the filters. OK, where’s that salt? Of course, the lack of a soft food disposer didn’t make that job any easier. Over here, you do have to wash the stupid dishes before you put them in. Mind-boggling. I did not expect the stupid dishwasher to be a Warmduscher. I expected it to wash my dishes without needing help. Ironically, one cannot turn off the heated dry cycle on most German dishwashers. Who was that carrying on about energy savings? I won’t miss the water in Germany with all of its issues at all. I will go home to my 50 gallon gas-fired hot water tank full of nice, naturally soft Great Lakes water. I will stuff my dishwasher with dirty plates, turn it on, and use the time I’ve saved by not washing them first to take a long and just-perfectly-hot shower without worrying about temperature fluctuations. I will be a Warmduscher in the literal sense. And it will be glorious. What with the trend to equalize the sexes on signage in the EU, I decided to fix this one. A colleague of mine recently bought a Golf. A blue Golf. He was thinking about getting an A1, but didn’t like the loud colors. This from a guy who wears purple plaid shirts to work. Southern Germans, specifically Audi, basically invented the boring silver car that seems to drive the perception of and image of German people in the US. The real reason for the silver cars is that most German execs don’t want to be seen driving flashy cars, to the point that they will order the boring silver car with the badges removed. No chance at identifying it as better than anyone else’s, that might attract envy. Whatever. 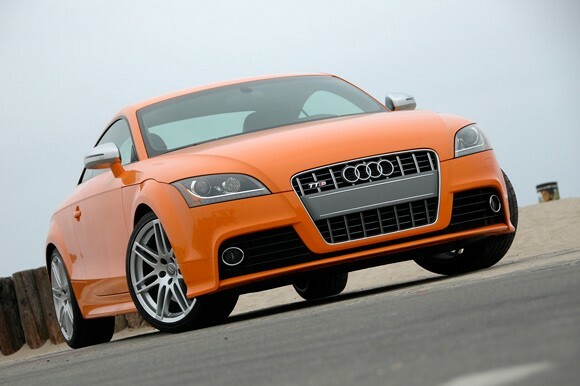 The only other color Audis seem to be available in over here is trash-truck orange. I don’t get the dichotomy, but I do love it. German people are a colorful dichotomy in every part of their lives. They decry the possibility of sharing personal data, but give out their bank account information like candy on St Martin’s Day. They don’t want to be seen, but dress in beautifully colorful and creatively designed, extremely close-fitting clothes. Which they happily remove completely at sauna. They are the first to blur their license plates and house numbers on Google Maps, but they drive bright green cars which they park directly out front. Have I mentioned the number of personalized license plates? They are everywhere! I love the color. I love the patterns. I love the lack of grey in daily life in Germany. I love the close-fitting tailored clothes. I love the fact that the typical German person takes the time to carefully choose what to show and what to hide, rather simply hiding everything or showing everything, like we do in American culture. Let’s face it – if you are worried about your thighs in the US, you wear a grey suit cut like a flour sack to work, regardless of the fact that your upper half would make the cover of Vogue. 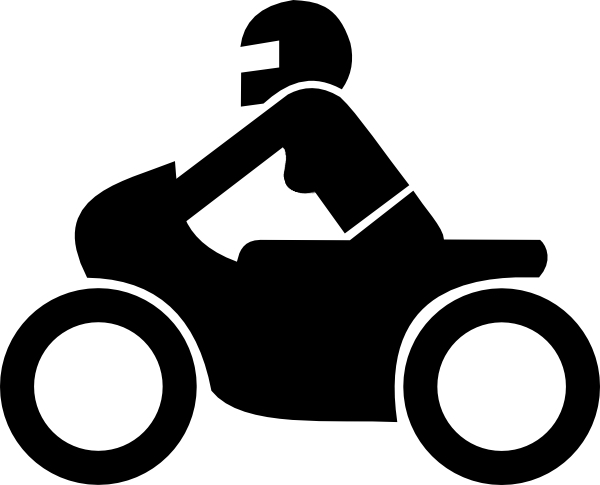 Here in Germany, ladies pay little or no attention to their less-stellar-looking parts and focus on drawing attention to what looks good or even great. Guys are the same way – dressing for what works, rather than for what doesn’t. And the color! Did I mention the color? Or the prints? Or the plaids? Oh, fabulous!! There is a reason Desigual is beloved here. Before I left, quite a few colleagues mentioned that I would likely fit in much better in Germany due to my clothing habits. And I did. Then I went even further. I put aside all of my grey sack suits and I bought a hot pink suit that is cut just so. I customer ordered pink and white motorcycle leathers. I dropped a small fortune at Desigual, and I have a few more items in mind to grab before I leave. Oh, wait, I’ll be back, so there will be no end to my Desigual habit, I think! It drives my American colleagues nuts when I and my attire walk into a room. I no longer care – I am sorry that they are afraid to look awesome. I am not any more. I am no longer ashamed of my body or of my colorful sense of self. I will continue to use color for purpose. I am contemplating replacing my old blue Passat with a froggy green Golf one day. Or a yellow Elise. Yes. A yellow Elise sounds just about perfect. I will miss Germany, for sure. Germany is cool. A different cool than Detroit, which I have missed for the past 3.5+ years. I will also miss the TÜV. Germany’s much maligned inspection authority is not really the end of the world. Sometimes, it’s the only way to get things done. Last month, I was back home in Detroit and needed to visit the tyre shop. Two of my snow tyres were leaking air, and I wanted to get them checked out and probably remounted. I’ve been using this shop for more than ten years, and sent countless friends there. I don’t know how many tyres I’ve bought from them, it’s a large number. The techs remember me, even though I haven’t been around (or buying lots of tyres) for the past three years. However, they refused to work on the car at all. They added air and sent me packing with no technical assistance whatsoever. Why? Because I run spacers up front to correct the offset on the wheels I use for winter driving. The VW OEM Classix wheels I use require 10mm of additional offset to clear the suspension on my B5 Passat and keep the steering geometry properly arranged. I use a nice set of H&R hub-centric spacers and proper-length bolts. The rear wheels, which do not require this modification, do not run spacers, and they were the ones leaking. I fully understood that the shop would not touch the fronts, but for sure the rears…. Nope. No way. The car has spacers, no touchy. Now I have to find a new tyre shop. One that is not averse to properly setup cars. One that can get beyond panic attacks when customer shows up with something out of the ordinary. One that can measure bolts and add. In Germany, this would not have been an issue. I would have showed up, handed over my paperwork, and gotten the repairs done. 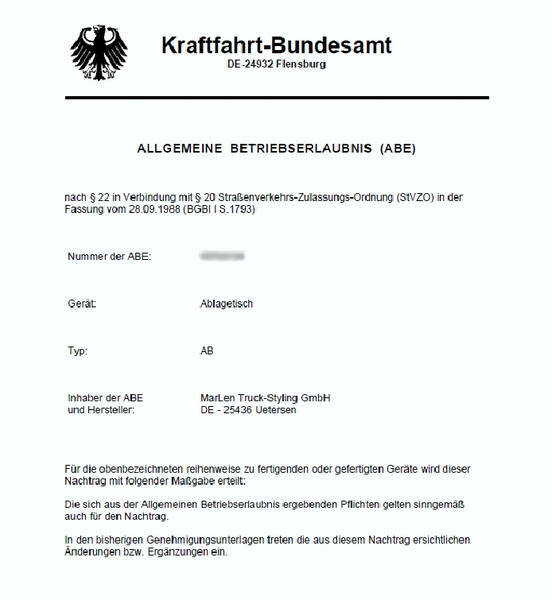 My paperwork would (and does) consist of a stack of ABEs – allgemeine Betriebserlaubnisscheine – the documents that say, yes, this is approved for general use on one or another cars. A matching set of papers for my wheels, spacers, and bolts, and no problem, because the tyre shop would have written proof that everything was in order and therefore safe to work on. For as much moaning and groaning as the Germans do, there are far far far more officially modified cars as a percentage of the general population in Germany than in the US. Nearly every car owner has a set of extra wheels or tyres or so on that requires papers. And once you have papers, you have papers. End of discussion. Just keep track of them. You’re going to need them at the tyre shop, but so will everyone else. My German colleagues, right down to the least-car-aware of them, were shocked that I would run into such an issue in the US, because who needs papers over there, right? The truth is that the TÜV serves as a backstop for just about everything. Not sure where to place blame? Ask the TÜV. Better yet, ask for TÜV papers. Have them, and you are golden. Nope? Maybe sweat a bit, and go get them in a hurry. It’s really far less of an issue than anyone makes it out to be. Of course, I always have papers. Maybe I’ll get lucky and find a new shop that does motorcycles tyres, too. I am going to need some of them. And maybe they will even accept my ABEs….